About a year and a half ago (around September of 2016), we had a visit by some long time friends of the family my parents have kept in touch with over many years. During their stay, I showed off some of my current quilt projects. 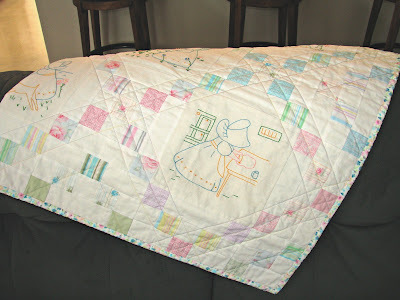 Well, Joyce, was impressed with my Raggedy Ann embroidered quilt and asked if I would be willing to put together a quilt using some embroidered blocks she'd sewn as a child and held onto over the years. I was honored, albeit a little nervous to be entrusted with her handiwork. 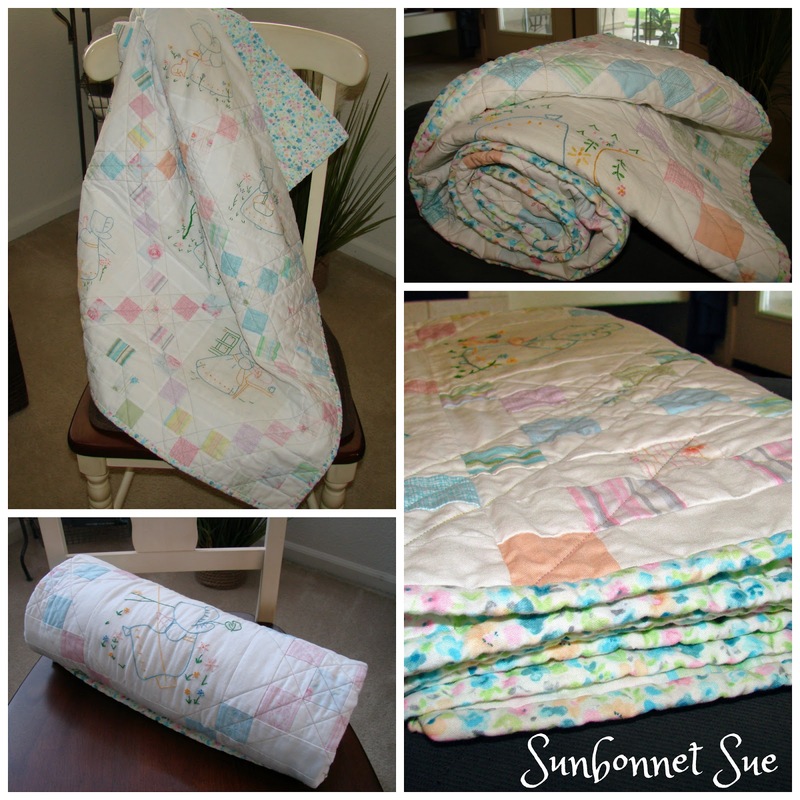 At the same time, I was up to the challenge of finding a home for the precious samples and began the journey of Sunbonnet Sue. Once I received the blocks, I quickly decided on a pastel color palette that seemed a perfect fit. The embroidery is immaculate especially knowing she'd actually done the needlework when she was a young girl around 1946. Fabric tends to break down over time so it was quite delicate. So I handled everything with great care and little by little came up with what I refer to as a lattice design where diagonal lines formed by colored squares create a diamond like frame for each embroidered block. 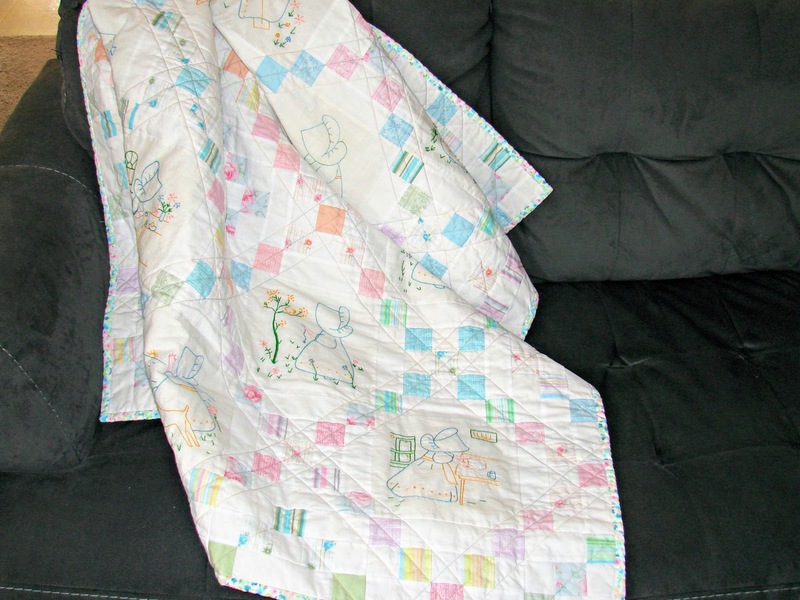 The size and amount of embroidered blocks dictated the overall finished size which turned out to be a small child's lap/nap quilt. While working on the quilt top, I had to come up with a backing fabric. Sometimes finding coordinating backing fabric can be difficult. I searched online and in local stores and even bought some I didn't end up using. But I finally found some that seemed to be a good fit, on line...which meant I had to cross my fingers and pray it would work. Luckily it was a perfect fit! I used the backing fabric as a binding too, so it shows along the edge of the front and the quilting along those diagonal squares helped outline the blocks even more. Finally it was time to make the label to include the name and some details. My mom's friend seemed genuinely pleased with the outcome and I feel blessed to have been part of preserving something so precious and sentimental.